The event took place as schedule on a beautiful spring evening in May. Journalist and photographer from the Enfield Independent were there to cover the event. 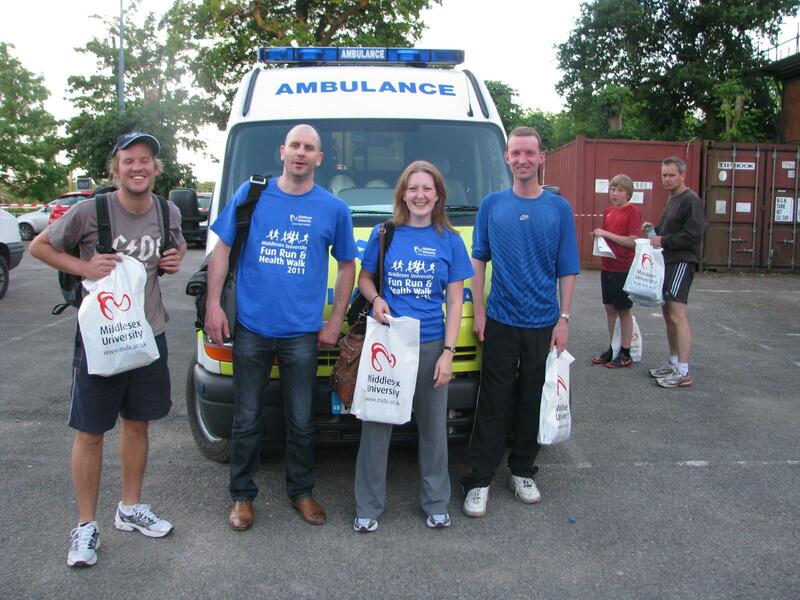 Middlesex colleagues seeking medical assistance after completing the grueling 5km fun run. Over 250 people participated in the event, while 141 of those people were Middlesex staff and students. Mel Parker, Head of Sport at Middlesex University, said: “The Fun Run was a great success and it was pleasing to see that the turnout was up on last year.” A total of 108 staff members and 33 students participated in the Fun Run and Health Walk. The following day the headline on the Staff Intranet read, “Middlesex staff help put the fun back into fundraising.” In total, £1,752 was raised for Save the Children which exceeded our target of £1000. After the event the Fun Run Committee celebrated with a pint of cold British larger while we reflecting on the satisfaction of meeting our campaign objectives. It was a very reward experience and it seemed a fitting finally to complete the 5km circuit alive. Thank you for joining Middlesex University as we begin our journey towards supporting the Mauritius’ Olympic Team in preparation for the London 2012 Olympics. Over the next 19 months we will progressively take Olympic steps towards building national enthusiasm surrounding the games as well as bringing the Mauritian and Middlesex communities together. As well as offering our support to the Mauritian Olympic Committee by offering access to Middlesex’s sport coaches and facilities, we also aim to extend our support beyond their Olympians. Middlesex intends to use the London 2012 Olympics as a platform in which we can engage with a younger generation of Mauritians though a series of visits by Middlesex students and staff in order to run athletic clinics throughout the island’s schools. The National Olympic Committee for Mauritius was founded in 1971 by Ram Ruhee who remains its Secretary General. 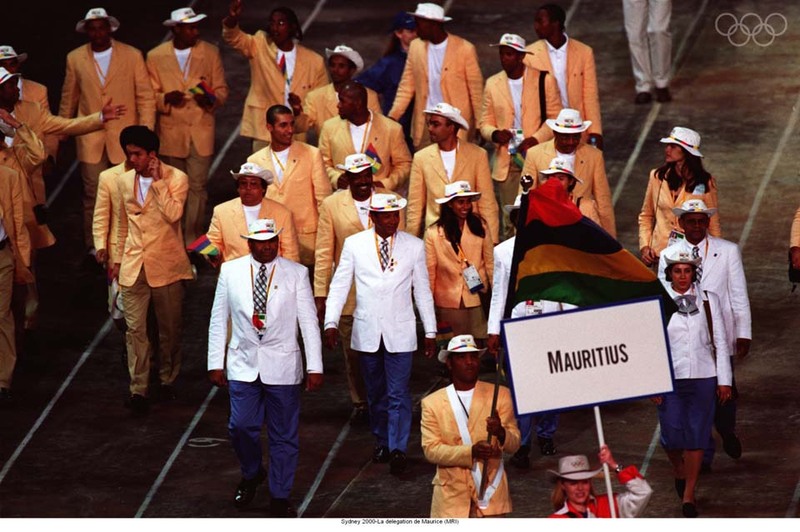 Mauritius first participated at the Olympic Games in 1984 and athletes have competed in every Summer Olympic Games since. At the 2008 Beijing Games, Bruno Julie secured Mauritius’ first ever Olympic medal in the bantamweight boxing. He was joined by 11 other country men and women who competed in a variety of disciplines including archery and weightlifting. Middlesex’s flagship campus is located in North London; approximately 8 miles to the site of London 2012 Olympics. Middlesex has built a strong reputation as an internationally active university with a large percentage of international students studying Middlesex programme in London as well as abroad at out offshore campuses and partner colleges. In January 2010, Middlesex opened the doors of their latest branch campus in Mauritius. The island nation in the Indian Ocean has a modest population of 1.3 million and the campus has a growing number of students studying UK approved Bachelor degrees in Vacoas. A year earlier, Middlesex awarded an Honorary Doctorate to the President of Mauritius, The Right Honourable Sir Anerood Jugnauth, for his contributions to politics in Mauritius. He commented: “I am thankful to Middlesex University London for inviting me to be associated with the establishment of its campus in Mauritius.” Education is high on the agenda of the Mauritian Government and the President plans to develop Mauritius into a knowledge hub for the region. Ahead of the London 2012 Olympics Mel Parker, Head of Sports and Recreation, at Middlesex came up with the idea of linking with the Mauritius Team. Drawing on Middlesex’s connection with Mauritius as well as the University’s access to quality sports coaches and facilities in London, Mel discussed the idea with Tony Eddison, Director of Middlesex’s branch campus in Mauritius, in December 2010. Together they agreed to approach Ram Ruhee of the National Olympic Committee for Mauritius with their proposal in January 2011. Our story begins here and we’d like you to join us along to road to 2012. A little like our own Olympic torch relay.